Elegant and delicious kosher gift baskets delivered in NYC and nationwide. 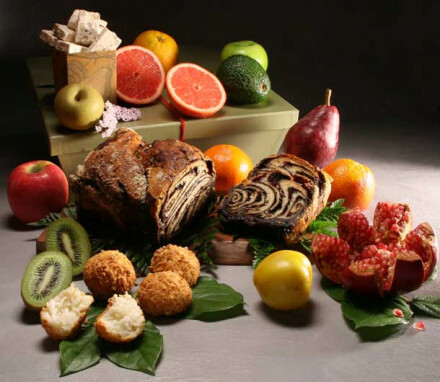 Our kosher gifts feature seasonal fresh fruit and the highest quality kosher chocolate, babka, nougat and honey. 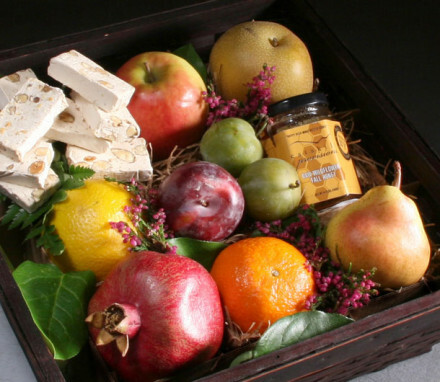 Manhattan Fruitier offers the most elegant kosher gift baskets in New York. We can hand deliver any of our kosher fruit baskets in the greater New York City area and we can ship anywhere across the USA. Our kosher baskets include delicious kosher treats like raw honey, honey almond nougat, babka, chocolate, fresh-baked rugelach as well as seasonal fresh fruit. If you need your kosher food basket to be delivered before sundown for Shabbat, we can ship overnight for a Friday morning delivery. Or, if your kosher gift basket is going within the New York area, we can deliver it by hand on Friday before 4pm. Fresh fruit is naturally kosher so any of our all fruit gift baskets can be considered a kosher fruit basket and an appropriate choice for the Jewish holidays or any other occasion that requires a kosher food gift. Celebrate the Jewish New Year with a sweet and delicious kosher, Rosh Hashanah gift basket or send your deepest condolences during a time of mourning with a heartfelt Shiva basket. If you want to send kosher accompaniments with fruit, we offer a range of kosher gift basket sizes and a choice of kosher sweets. All kosher gifts show clear kosher certification for your gift recipient’s reassurance that the products meet their kosher standards. Feel free to call us at 800-841-5718 if you need additional information on a specific kosher product. You can also browse our Kosher for Passover gifts.